Isn't this gratin pretty?! The photograph shows the unbaked casserole but the color holds pretty well in the oven, too. It's a lighter version of one of seven vegetables at this year's Thanksgiving table but the red and green make it perfect for Christmas, too. Did I mention delicious? That too! Some of the lightening came by accident when it turned out that the refrigerator's chunk of Parmesan was all rind and no cheese. Next time, I would include the Parmesan because I did miss some level of richness. That said, this was extraordinarily good as made, even without the cheese. Cook the spinach. While it cooks, heat a large, deep skillet on MEDIUM, add the butter until it softens. Add the onion and saute until soft and golden. Add the artichokes and let cook together for a couple of minutes. Stir in the spinach and the remaining ingredients. Transfer to a lightly greased two-quart casserole dish. Transfer to oven for 25 minutes (so says the inspiring recipe). Otherwise, refrigerate, remove from frig about an hour before going into the oven and cook for about 45 minutes or until very hot and bubbly through the middle. The recipe recommends 25 minutes in the oven if baked right away while the ingredients are still warm. I made it in advance, took it out of the frig for an hour before going into the oven, it was hot through the middle in 45 minutes. My name is Patricia and I am a firm WW lady (maybe not so firm outside, but inside). My husband and I retired early and live in the woods, on a lovely little creek, with lots of wonderful wildlife, in the state of Oklahoma. About 9 weeks ago, I went back on the WW plan. I had gained too much and decided that if I was going to make a life-style change this time and stop yo-yoing up and down the scales, I was going to have to find some really good recipes that became the norm at our table. (Ya’ don’t eating out much in the evening living in the woods, unless you want to drive 20-30 miles to find something besides burgers & pizza) My husband loves his beef, is constantly trying to gain weight and hates anything that is labeled “fat-free”. With that said, he is my biggest supporter as long as I don’t make him “cluck” (too much chicken in a week!). He’ll try anything. Most importantly, he likes an assortment of vegetables (with his beef, of coarse!) I found yours and Kayln’s web sites within a couple of weeks of browsing the web and you both have changed my life. I use some of your recipes like “Easy Green Beans”, so often that I don’t need the recipe any longer. 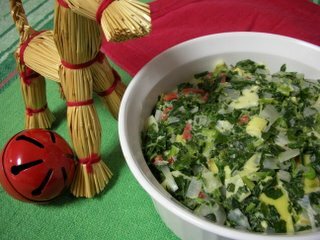 Your Spinach & Artichoke casserole (here) is a low point version of one of my old favorite staples. When I serve your version, no one knows and I don’t tell. I also adore your Asparagus soup. Have some in the fridge right now. Can’t beat the Pork Chops with apples and sauerkraut. It is just wonderful! The list goes on. My husband grew up in St. Louis and graduated from Washington University. We met there, while I was attending Lindenwood College (it was a girl’s school when I started there. Dates me doesn’t it! ), got married and had our first child in St. Louis. We still have family and friends who live in Florissant. When you talk about the grocery stores, the Farmer’s Market and Pevely Dairy, I can picture them all in my mind. We still go to the Farmer’s Market when we visit my husband’s father who is now 99 years of age. I can’t help but over buy when we go there. Love those veggies! I am not one to e-mail strangers and have never been in a “chat” situation, but I did wanted to say “thanks” and tell you how much we have loved your recipes. I have lost 15 pounds (rather rapidly I might add) and have but a few left to go. I don’t think I’ll ever have this much weight to lose ever again, because of you and Kayln. That is if I can keep it to one glass of wine, both my husband and father-in-law were in the wine business and we love our wine! PS: Is it appropriate to share a couple of recipes with you? I have two, quick recipes using tomatoes that I think you would enjoy. Tis’ almost the season. If acceptable, Where and How? PSS: You look so much like the wife of a business associate in England that it is uncanny. Have any relatives there? Hi Patricia ~ Wow - "this" is why we blog! Your message means so much, thank you for e-mailing a 'stranger' to introduce yourself and share your experiences. I'd love to get your recipes, please feel free to e-mail me (address is below the photo). PS Yes, lots of relatives in England!